Dr. Amber Henderson was born and raised in Calgary, where she attended the University of Calgary, completing a Bachelor of Science in Biological Sciences and a Bachelor of Science in Psychology. 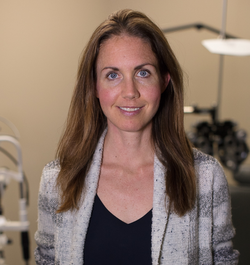 After finishing her undergraduate degrees, Dr. Henderson spent a couple of years working as an optometric assistant at a busy practice in downtown Calgary. Having discovered her passion for optometry, she decided to go back to school to become an optometrist. Dr. Amber Henderson was awarded her Doctor of Optometry with Distinction in 2014 from Pacific University in Oregon. She was elected as a member of the Beta Sigma Kappa International Optometric Honor Society through all four years of study and was hired as a tutor for a couple of courses in her third year. Her final year of optometry school was spent working at a glaucoma specialty clinic in Utah, a private practice in Colorado, a military site in Germany, and an ocular disease Veterans Affairs clinic in Kentucky. After having spent the last four years abroad, Dr. Henderson is excited to finally be returning back home to Canada to start her career. Having fallen in love with the west coast, she decided to make the move out to Nanaimo, where she could enjoy her favorite sports (running and triathlon) year-round. When she’s not in the office, you will likely find Dr. Henderson outside hiking, biking, or running along one of the Island’s many magnificent trails. Dr. Henderson is excited to be joining the team at Eye Care Nanaimo and looks forward to providing unique solutions to meet your specific vocational and recreational needs!